Being able to quickly connect and manage the machines and devices under his or her responsibility is essential to the duties of any network admin. In more complex networks, there may be multiple domains, tens or hundreds of routers/switches/appliances that are routinely telnet/SSHed into, plus hundreds of Windows and *Nix systems that must be logged into on a regular basis. Network admins who maintain Citrix XenApp or Microsoft RDS session host servers deal with this scenario daily. Even Windows administrators who do not have full Remote Desktop Services deployments still use Remote Desktop Services for simple administration of their servers – not everyone is a PowerShell wizard. Managing all of these credentials and connection preferences can get very tricky. Yes, some of us still have a folder full of RDP files, but fortunately, there is a much easier way to maintain all of this information. Devolution’s free tool, Remote Desktop Manager Free Edition, makes managing all of your remote desktop connections and credentials super easy. The wonderful folks at Devolutions, whom I’ve had the pleasure of meeting and getting to know at several industry tradeshows like BriForum, offer a free version of their incredible tool, Remote Desktop Manager. For the admin who is struggling to organize, manage, and remember all of the credentials and settings associated with his Windows RDP logins AND the rest of his devices on his network, it is indispensable. The ability to save credentials and then connect to more than a dozen types of systems and devices/remotely, beyond regular Microsoft RDP connections. This includes Apple Remote Desktop, Chrome Remote Desktop, Citrix (ICA/HDX), Dameware, FTP/SFTP, LogMeIn, Telnet, SSH, and so much more. The ability to shell out to other management tools like Event Viewer, the Services MMC applet, Computer Management, Ping, Traceroute, and the ability see if a device is online (using both a Ping and a port check). 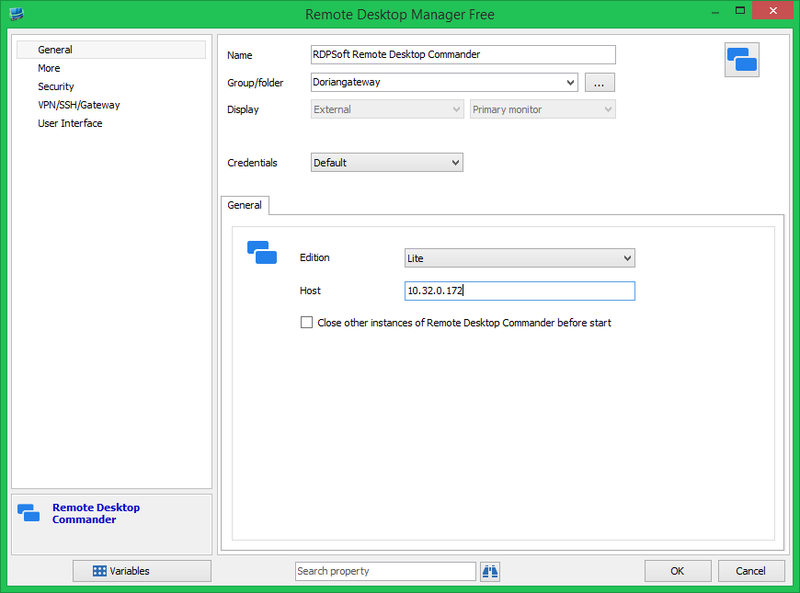 Now you can launch RDPSoft’s free Remote Desktop Commander Lite directly from Remote Desktop Manager for advanced management of RDS/Citrix session hosts. Over the past few months, Devolutions even added a hook to Remote Desktop Manager so that you can launch RDPSoft’s free Remote Desktop Commander Lite tool to manage all of the sessions, processes, and other items on RDS and Citrix XenApp session host servers. When installed on the same system, these two tools are a great “one two” punch for any network admin, but especially for the Citrix and RDS admins. Grab both of them today, and free up more of your valuable time by leveraging their rich features.